Very good stuff. For the price it's just faboulous. Sound is pretty accurate, though always in an enjoyable way. Bass is average, but mids and highs are beautifully smooth, especially in the 192 KHZ upsampling mode. Video very very good. All in all fantastic value. One must turn the video bypass circuitry off (front panel switch) to hear the best CD sound. Even today this player can hold its own easily against $1000+ CD players (with bypass engaged). I check out high end cd players in the $1000 range every now and then and this philips is still with me. Video quality is quite nice and smooth. Poor quality of transport, CD sound is really not very good at all but SACD makes major stride in the right direction. When I had initially purchased this player it was the source for a Harman Kardon Signature 2.0/2.1 setup. In this setup it faired quite well against the H/K onboard DAC’s, and an Arcam CD72. But in the my stereo system the player show that when it comes time to deliver the music, it falls short. When played through the Pass Labs X2.5/Bryston 3B-ST setup the differences between it and the Arcam CD72 become far more pronounced. The bass is big and tubby and really does not have as much definition, leading edges to instruments are mostly forgotten, and soundstage is narrow by comparison. It provides less detail and transient edge to the sounds but that makes it more forgiving on awful recordings. SACD does improve the sound greatly and moves it right into the competition to the Arcam. The bass is still poor but everything is a better. The soundstage still does not match the width that the Arcam provides but depth seems a bit better. This is by far not worth 5 times its price. But in its price range it is a fairly decent player with all the issues that prior review mention on the quality with my unit failing to play DVD’s other units play flawlessly and the tray becoming jammed all too often. For people using this player in the average home theater it would serve the purpose well. Most HT systems can not adeptly show the differences between sources as a dedicated two channel system. Therefore spending more money on a player would be a waste. While in a two channel system I could not recommend this player at all. The QC issues knock it down another star. Very good redbook CD, and excellent SACD playback. The 192 kHz up sampling kills the bass in all music. Automatically starts playing cds once disks are loaded. I read numerous online reviews of this machine, and some stated that this player was not reliable. Well, I have to admit that my player has played flawlessly since day one. It has by far exceeded my expectations in every way. I wanted to try super audio CDs and figured that a good Philips or Sony player would be the way to go since they invented the format. I decided on the Philips DVD963SA after much research online and the very good price offered at J&R. This DVD/SACD player was purchased to replace an older JVC multidisc player. Once I hooked the DVD963SA up to my Onkyo TX-SR600 immediately I could hear things in familiar songs that I had not heard before on redbook CDs. It is a much better machine than the JVC player. It seems to be a very good SACD player as well, but I have only been able to play on SACD on it so far only because I haven't purchased very many yet. The recording is Mendelssohn's string quintets 1 and 2 by BIS . The recording is a hybrid and multichannel disk and it really sounds splendid. It's like being at a concert. No kidding. I am really looking forward to acquiring more SACDs. The sound is more dynamic but also smoother than PCM. Analogue; but with very good details and ambience. So far I have had absolutely no problems with this player. I give it two thumbs up. 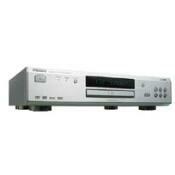 It is also a very good DVD video player offering a superb, very sharp picture. The Redbook CD sound is outstanding at this price and at 5 times this price. Excellent DVD video and audio Performance. Has very good SACD perfomance. Outstanding "VALUE". Remote not backlit and could be better but at this price who should care. I have an $20.00 ONE FOR ALL backlit remote the works geat as an repacement. I have been into audio for more than thirty years and have owned a tremedous amount of audio related products. This Philips DVD 963SA being my latest and quite possibly the greatest in respect of the price I paid. My system is a bit more than ordinary. I have never been totally satified with any loudspeakers of the mass market types so about 15 years ago i desided to Triamp my systems using active crossovers. Since then I have used many active crossovers and am curently using an Madisound Sledgehammer 24CX-4 which was manufactured for Madisound by TDM-Design in Oregon. This is the most transparent active crossover I have ever used. I use Two ATI 2505 250 watt per channel amps. One for each channel and subwoofers. My main Speakers are my own design and crafted by myself. The each consist of 2 Vifa XT25TG30-04 Tweeters, 2 Audax HM130CO Mid-woofers and 2 HI VI Reasearch W10 woofers. Subs are Peerless XLS 12" with matching Passive radiators. Suurrouds each consist of 2 audax HM130CO Mid-woofers and Seas Tweeters. ENOUGH OF THAT!! Just wanted to make all aware that my system can reproduce sound extreamlly well. As for the DVD-963SA it is a real Gem of a CD Player. My other Player for 2 years is The Sony DVP-S9000ES. I can only say that compared to the Sony CD Playback, the Philips wins hands down. The Philips is so much more detailed. Vocals are cleaner, Drums are much tighter and natural. The upsampling adds air to the sound and ever further reduces fatigue that is quit common on most disc. The Sony will not be used for listening to Redbook CD's any more. When Playing SACD,s the Sony is the winner by a fair margin. I actually have two SACD recordings of Bob Dylan. I did an A/B comparison with both disc sychonized. The Sony is the clear winner here. Comparing Video performance was nearly a toss up. Using the component video cables to interconnect to my HDTV I used the AVIA Video setup DVD to setup and adjust the video on both DVD's. Both Sony & Pilips DVD performance is Excellent. The Philips was almost perfect out of the box. It only required a slight contrast adjustment. The Sony needed much more adjustments but the Sony has far more tweekability than the Philips, although the Philips dosn't need it. Once adjusted the Sony performed nearly as well. Musicallity, acoustical isollation, timing, involving, musicians do not dissapear Plays CD's, SACD's and DVD's!!! I was after a CD player to replace and improve upon my budget JVC that had started to not be able to read most of my CD collection. I took it with me to hear it in a single speaker dem against a Naim a Linn and a Cyrus. There was dissapointingly very, very little improvemet over my player, with the Linn coming out best by the tiniest of margins. I went away to rethink my position as £1200 is a lot of money for such a small improvement. Thanks to this site and others I decided to take a gamble and buy a Phillips 963sa from John Lewis. I am absolutely delighted to say that the new purchase sounds very similar to my Linn LP12/ Ittok and I like the upsampling best (by a small degree) at the highest level of upsampling. This player provides more musicallity than any other CD player I have heard. It provides an insight to how the musicians are playing off one another and provides light and shade in the way an LP12 does. When the music becomes complex musicians do not dissapear into thin air like they do on all other CD players I have heard. The are a perfect accompliment to Quad ESL 57's. I have yet to purchase a SACD and my first will be the new James and Lucky Peterson disc entitled 'If you Can't Fix It' on JSP records. One question about the remote control - is it meant to light up? Mine doesn't but the buttons look like they should. Happy listening to you all. Nothing like it - it's unique! Sorry my typing is poor: there is not spellcheck available. The default upsampling is the one I like for cd. Build quality is good. Assembled in Hungary. Probably has better circuitry than high end players cosing thousands. I bought mine from Good Guys so I could take it back like I usually do when it does not sound so good at home. I kept this one: might even buy a second one if the price is right. If you like music and clarity, harmony and beauty, try this unit and see if what I say is not true. An unbelievable value for the current street price of 300-350.
you name it, I have heard it. This is an outstanding unit well worthy of your onsideration. It has the best sound of any palyer I have ever had in my home, both for CD and DVD. it does not add artificial dynamics but presents the music in a pure and smooth way. Teh picture is good but as other reviewerws have noted, need a little adjustment of the parmaters to get it right. The CD upsampling is just great. 192 KHZ setting sounds good to me. I belive they are using the top audio dvices 24 bit 192 khz D/a converster with a smaple rate convetor to get the upsmapling. This is very high quality circuitry for a bargain price. If you like smooth analog type sound you must try this unit. I have over 30 years experinece in audio and I sincerely feel this unit is outstanding. So far I have had no relability problems. Please note hta the disc drwaer opens if it cannot read the disc because it is dirty or scratched and the disc needs to be carefully centered. Also it will repat the oringal scene if the video cannot be read. This is not a problem with the player. Thwe warraty is only 90 days labor, suggest estneded warranty. many many: Denon, Sony etc. etc. Stunning video quality and stellar audio performance make this machine shine.It easily put every machine in this price category(and many more expensive players)to shame.Plus it has upgradable firmware. No disc eject on remote.Not able to turn off front display.Slow layer changes on some DVD's. Bought this player just to try out and see how it would compare to my tried and true Sony DVPS7700.Well needless to say it outperformed my Sony in both audio and video and I will be keeping this machine.Color saturation and accuracy is excellent in both interlaced and progressive output into my Infocus X1 front projo (with the progessive out having a slight edge).Audio upsampling to 24bit 96khz made a noticable improvement in sound quality.Giving a more open and airy sound,free of grain and harshness. Major bang for the buck on every format. For this price?....you have to be kidding. I belive that anytime a 500.00 player is superior in everyway to a 1500.00 player it deserves maximum ratings. I replaced my second Denon 1600 whith one refusing to play any disc and the other had an H02 code whith the 963sa. The 963sa, much to my suprise offers better video after a little adjusting of the many video adjustments in the menu. The upsampling is nice but I think other posters here do not have a revealing enough systym to take advantage of it. The player even outputs a 192hz digital signal if you have the gear that excepts it. The sa-cd performance is fantastic and easily outperforms my 1500.00 Sony 9000es which is quite the trick for a player that generally sells for even less than 400.00 at this time. I have had mine for around 8 months and my brother in law has had one around seven months whith absolutely no problems what so ever. Some of the other posters whith quality control issues must be buying seconds or something as I have read 100's of posts on the 963sa and don't remember anyone ever saying there player died ect. Sony 9000 es, Sony 7700, Samsung hd931,Denon 1600,Arcam dv-27,Denon 5900,JVC xa700 and a few more.